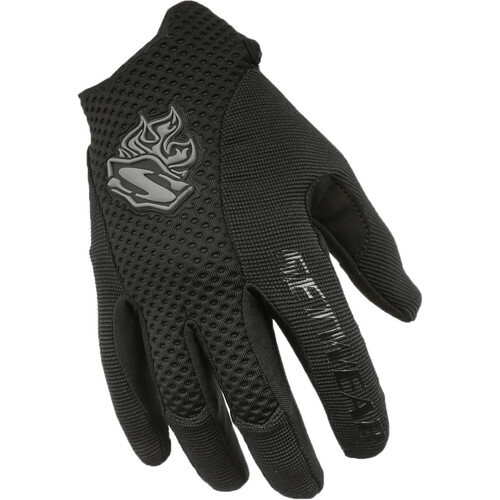 Increase comfort, safety, and endurance with these unisex medium-sized V.2 Stealth multipurpose work gloves from Setwear. Shown here in an appropriate and functional all-black color, these gloves make an ideal option for event photographers, production personnel, and stage crew who often need to protect their hands, maintain dexterity, operate touchscreen devices, and keep up a professional and inconspicuous appearance. Looking beyond their aesthetics, you'll notice these gloves have several physical attributes that make them appropriate for a variety of tasks. Firstly, they are made from a breathable, formfitting material and have padded neoprene top sides that create a combination of flexibility and strength to keep your hands comfortable and protected while you work. On the flip side, the palms of these gloves have been designed from a ventilated synthetic material that is touchscreen-compatible. Therefore, in addition to increasing grip and maximizing comfort, these gloves provide convenience and efficiency since you don't need to take them off in order to use your touchscreen-equipped camera, smartphone, or tablet. Looking at the cuff design, you will notice several accoutrements that add to the comfort and functionality of these gloves. They have adjustable hook-and-loop fasteners that allow you to create the ideal fit for your wrist. They feature loops that help you keep the gloves from getting separated and lost by joining them together with the included carabiner. Lastly, they have a unique shape that has been thoughtfully designed to leave space for your wristwatch.